Analytical Graphics, Inc. (AGI), a developer software applications and development tools for timely and cost-effective development and deployment of space, defense and intelligence missions, has released the 11.0 version of Systems Tool Kit (STK) is a physics-based software geometry engine that accurately displays and analyzes land, sea, air, and space assets in real or simulated time. Users can model the time-dynamic position and orientation of these assets via various propagation algorithms or external inputs. Given these dynamic positions and orientations, users can model the characteristics and pointing of sensors, communications, and other payloads aboard the asset. STK can then determine spatial relationships (e.g. line of sight) between an asset of interest and all of the objects under consideration across multi-hop links or over regions and volumes of interest. STK can assess the quality of these relationships through a wide array of constraining conditions (e.g. payload capability, unique user algorithms, etc.) while also incorporating environmental effects such as lighting and weather conditions on sensor visibility or communication link quality. STK's technically-accurate 2D and 3D visualization and analytical data outputs can help enhance situational awareness and understanding. 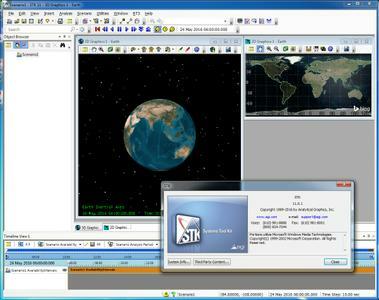 Users can share their results with others via snapshots, movies, reports, graphs, and even VDF files for use in STK Viewer. STK's Programming Interface offers a wide variety of options to automate and customize STK and to integrate its technology into other applications. Additional options let you extend STK through plugins, interface to STK externally through COM and scripting interfaces, and develop custom applications. STK is used by thousands of users across a variety of application areas and throughout all phases of the program lifecycle. Welcome to STK 11; our newest and most powerful version of STK yet. The aerospace domain continues to grow in complexity due to the acceleration in the number of users as well as the demand for continuously evolving services in the commercial, civilian and defense sectors. With that in mind, the aim of this latest release is to improve the quantitative ability of STK to ingest and produce data and, in addition, to provide new tools and methods for viewing and interacting with those results in more intuitive ways. We have overhauled the STK architecture to help handle larger, more complex scenarios and analysis. A sampling of these updates include 64-bit desktop support, an upgraded compiler that provides better optimizations of core algorithms, and optimized allocation of large buffers for improved performance of parallel calculations for coverage and deck access. You can now stream worldwide terrain for both analysis and visualization from AGI's publicly hosted STK Terrain Server. The visualization is included with STK for free and the analysis is included with the corresponding licenses for terrain calculations. Furthermore, you can populate the STK Terrain Server with AGI's pre-processed terrain, along with your own private terrain data, to create a blended terrain mosaic with an online subscription or as an offline product for delivery on a private network. Volumetrics combines the flexibility of the analysis workbench with the spatial analysis capabilities of coverage. You can define a variety of 3D volumetric grids in any coordinate system, even if those coordinate systems are attached to moving objects. You can then apply spatial calculations throughout STK (including the new features in STK 11 such as phased array) to those volumetric grids. The new Volumetric object type allows you to manage these grids and spatial calculations and apply display settings to allow you to visualize your dynamic volumes of interest, including grid point settings, isosurface values, and translucency. Furthermore, you can import your own data for volumetric analysis and visualization. The new phased array antenna type can be used with both STK Communications and STK Radar to model a variety of new mission scenarios, including GPS Jamming, electronic warfare, and communications interference. The phased array antenna type allows you to specify the physical aspects of the antenna elements, using several standard layout types or user supplied data. Furthermore, the antenna beam direction and/or nulls may be defined based on STK objects, user supplied data, or plugin scripts. Additionally, you may select various beam and null steering algorithms including MVDR or custom plugin scripts, which compute the weights for each of the elements. These weights are then used to compute the antenna's gain pattern, which can then be applied to STK Communications and STK Radar calculations. Aviator is the next generation of Aircraft Mission Modeler, which provides an aircraft route-planning and design tool-set ideally suited for performing complex, highly accurate, time-dynamic analysis for both mission planning and operations, as well as aircraft systems design. Aviator now includes the ability to model fixed and variable wind speed effects on aircraft performance, additional procedures for modeling a variety of commonly flown aircraft route types, and a significant number of usability improvements. Aviator Pro is an extension of Aviator that allows you to model more advanced procedures by providing a selection of real guidance strategies relative to other aircraft, including intercepting moving targets, flying a constant relative bearing, orbiting a point relative to other objects, or maintaining formation with a cooperative aircraft. STK EOIR includes a multitude of improvements that provide more flexibility and fidelity for modeling detection, tracking, and imaging performance of electro-optical and infrared sensors. 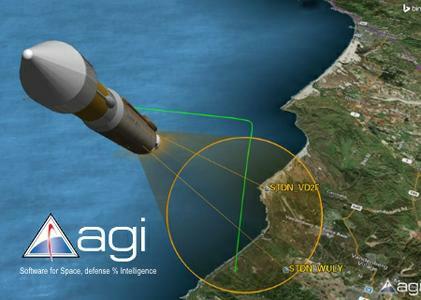 Applications include space situational awareness, missile defense and remote sensing. Most notably, EOIR now supports the MODTRAN atmospheric model. Additionally, users can now apply custom 3D models, materials, and temperature profiles. Finally, EOIR sensors have been integrated as a new sensor type in STK, which allows for object model support and access to analysis workbench components.